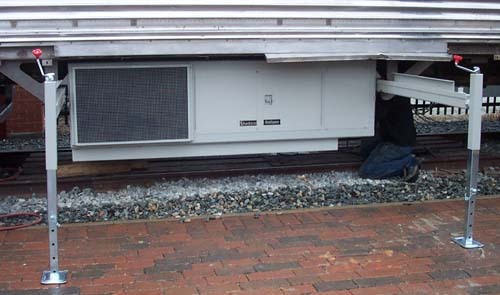 STADCO Railcar Generator systems are self-contained sound conditioned units, specifically engineered for reliable extended hour operation under a railroad passenger car. Low profile - Designed for underslung mounting. Optional roll-out service track makes service much easier. Sales drawings available for all models upon request. Control system: All automatic logic controlled. Variety of available options. See Northwest Rail Electric Generator Controls. Mark 5 sets come with full silencing enclosure, multi-layer sound insulation, critical grade muffler, and specially tuned rubber mounts makes these sets extremely quiet and vibration free. optional secondary vibration isolation package makes them even more quiet. Specifically designed for mouting under railway passenger cars, the Stadco RailgenTM diesel generators are a very good solution for small package auxiliary power under the floor of railway passenger cars. 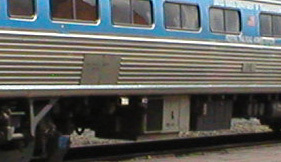 Available in sizes that may be used to provide HEP power to an entire train depending on the load characteristics of the cars. Stadco RailgenTM with roll out service track for maintenance. Note also that the service track end columns also have a height adjustment on them, so that the roll out track may be used with a variety of elevations of track-side platforms or other structures. Connected to a Northwest Rail Electric Generator Control a Stadco generator mounted under a railway passenger car is able to provide automatic backup power so that if the HEP system fails or is disconnected, the generator starts and provides power to the car automatically. Stadco RailgenTM series generators have a compact design, and as stated above are designed specifically to serve as auxiliary power units on railway passenger cars. Cars equipped with Stadco generators under them are still able to meet even the most restrictive undercar clearance requirements in North America. Note the Stadco diesel generator (center of photo) used as an auxiliary power unit on the metroliner car shown at right. There are a number of accessories available for Stadco under-car generator sets, in addition to the roll-out service rails shown in the above photo. Standard packages are 12 wire 3 phase 240 / 480 volts, but other outputs available include 208 volt three phase. Several unique auxiliary power units for a specific Northwest Rail Electric customer with unusual needs involved producing a generator with simultaneous 208 and 480 volt output. Various other custom options are available. An extended run package is available for many generator sets that extends the operating time between oil changes. For the most up to date information on Stadco Generators, models available, various features of specific models, and exact dimensions please see the Stadco Generators web site, and look in the "Railgen" section. Tier 3 and related are essentially sold out for the entire remaining production run. Several Control System Packages are available from Northwest Rail Electric. Please inquire about our generator controls and automatic generator starting packages to provide automatic starting and operation of your Stadco generator if extermal power sources fail (HEP or yard). These packages are our NW-GC500 models. Our NW-GC155 series of generator controls provide simple power car control and are also compatible with Stadco RailgenTM undercar generators, but due to the differences in the control logic they do not provide for automatic power upon HEP failure. Northwest Rail Electric Generator Controls are specifically designed for Stadco Generators and using our control systems with a Stadco generator is compatible with the Stadco warranty. HEP Parts including HEP Connectors for those adding HEP. Railroad Grade Wire for those upgrading or replacing railroad car electrical wire.